First Listen: Pixies, 'Indie Cindy' As assembled here, the songs on Indie Cindy form a worthwhile, frequently terrific document of a band forever in transition, even in middle age. It's music born out of chaos, same as it ever was. 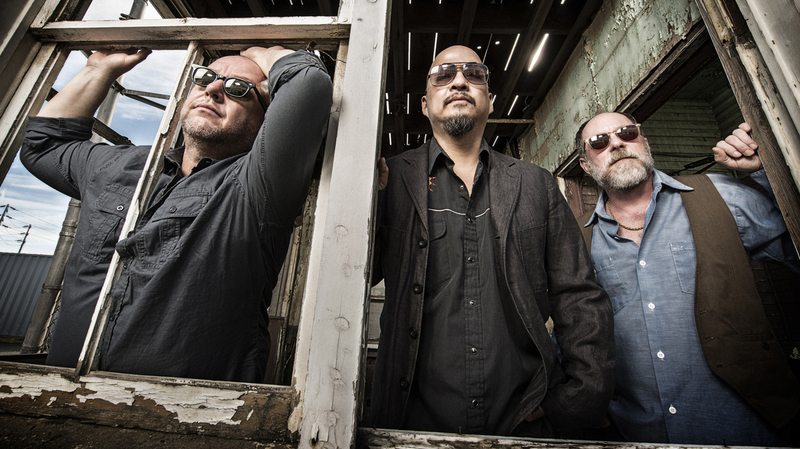 The Pixies new album, Indie Cindy, comes out April 29. Last year, My Bloody Valentine released its first album since 1991, and the result sounded as if not a minute had passed in the intervening 22 years. Every bleary, bended note of m b v sounded immaculately crafted, as if Kevin Shields and company had been toiling away in pursuit of perfection since the release of Loveless and merely lost track of time. Now, it's Pixies' turn to follow such an impossibly long delay — the band's last album, Trompe Le Monde, also came out in '91 — but the rollouts of Indie Cindy and m b v perfectly mirror the many differences between the groups themselves. My Bloody Valentine maintained complete control over its own resurrection: The existence of m b v was kept a closely guarded secret, unspoiled until the band announced with a few days' notice that fans could buy it online. Everything about its unveiling was as precise as the music itself. Indie Cindy, on the other hand, is the product of blurts and bite-size doses and false starts: the release of a single that no one saw coming, the early departure of Kim Deal that everyone saw coming, the steady trickle of songs and EPs that would eventually congeal into an album fans started receiving piece by piece back in June 2013. Taken in its entirety, in this order, Indie Cindy functions as a surprisingly coherent album, with disarming beauty nestled against dissonant snarls. Songs like "Bagboy," the caustic track fans first heard when Pixies' rebirth was announced last summer, were not delayed for years because they took so long to refine. But Indie Cindy still captures the band's alchemic mixture of abrasion, muscle and grace, even when the edges are left ragged or sanded down more than usual. None of the three bassists most prominently employed by the band in the past year — Kim Deal, Kim Shattuck and Paz Lenchantin — perform on Indie Cindy, leaving singer Frank Black, guitarist Joey Santiago, drummer David Lovering and longtime producer Gil Norton to work with bassist Simon "Dingo" Archer. Deal's absence, in particular, has already helped make Indie Cindy polarizing to Pixies fans. (See also: that title.) But as it's assembled here, the album is a worthwhile, frequently terrific document of a band forever in transition, even in middle age. It's music born out of chaos, same as it ever was.